The BEST commercially designed dip stand on the market for home gym use. Hailed as KING of the Upper-Body workout, Smartxchoices dip station will catapult your chest, shoulders and triceps into the next dimension! If you feel like increasing your workout with a weighted belt while dipping, there's no worry because this iron metal dip station can hold up to 500 lbs. This upper body developer gets its stability from the wide and extended base that eliminates rocking. 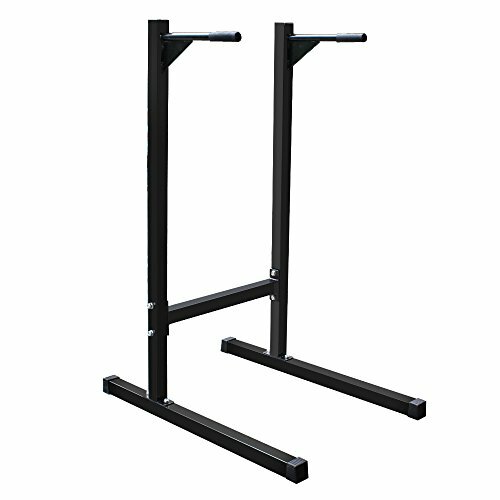 The 2"x2" heavy-gauge steel uprights are perfectly angled for all size users. Oversize bars with extra-thick and slip-proof rubber grips provide excellent comfort and allow multiple hand grip positions. Its light weight body will allow for easy mobility and its compact size keeps it from taking up too much space. Start pumping up those shoulders and triceps with this new dip station. Diameter of hand grip: 1 1/2"
Made of Iron and can hold up to 500 lbs. Product Dimensions: 40"(L) x 25"(W) x 53.75"(H) , Dip Bars: reach out 16"(L); thickness 2"(D), Product Weight: 32 lbs.